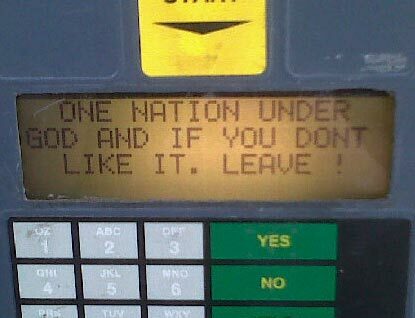 South Carolina: If you go to fill up your tank in West Columbia you may see the message "One nation under God and if you don't like it, leave." "I think it's good," said one driver. "I think people should have a choice, if they don't like it, they can leave." One woman says she continually gives the station her business because of the message. Wow are you serious?Religious condensation like this pisses me off!